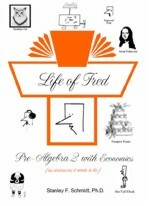 Life of Fred Pre-Algebra 2 with Economics is a hardcover textbook containing 288 pages. This book is not consumable. All answers are written on separate paper or in a notebook. This book is equivalent to a high school economics course. Need a lot of practice or stuck on a particular kind of problem? Requested by many readers, this book contains questions keyed directly to the chapters and topics of Life of Fred: Pre-Algebra 2 with Economics. The answer to every problem is worked out in complete detail. • Problems containing the continuing adventures of Lucy and her train station. • Complete solutions and answers! This book is mandatory for those who need it. The Zillions of Practice Problems Slogan: Do all these and you should reach teacher-level. 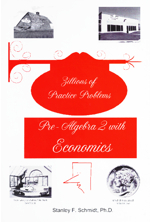 Life of Fred Zillions of Practice Problems for Pre-Algebra 2 with Economics is a hardcover textbook containing 208 pages. This book is not consumable. All answers are written on separate paper or in a notebook. This is an optional book of extra questions for those who feel the need for extra practice.